I am running my entire retirement investing strategy including expected annual returns and projected retirement dates from an excel spreadsheet. 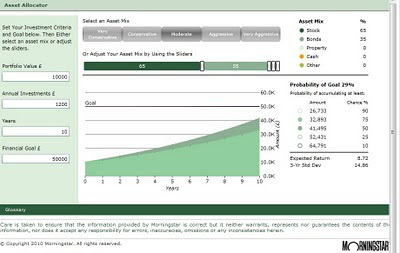 Today though, I stumbled upon a nice little tool that looks to be written by Morningstar which provides a quick way of mixing up simple asset allocations to project expected returns. Additionally if you enter the portfolio value, annual investments, desired years to retirement or similar and your total financial goal it provides a probability of reaching the goal. Link here. 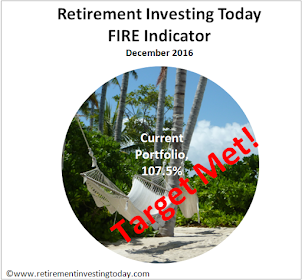 I entered my retirement investing strategy into the site which included a Portfolio Value which is currently at 40% of my Financial Goal. 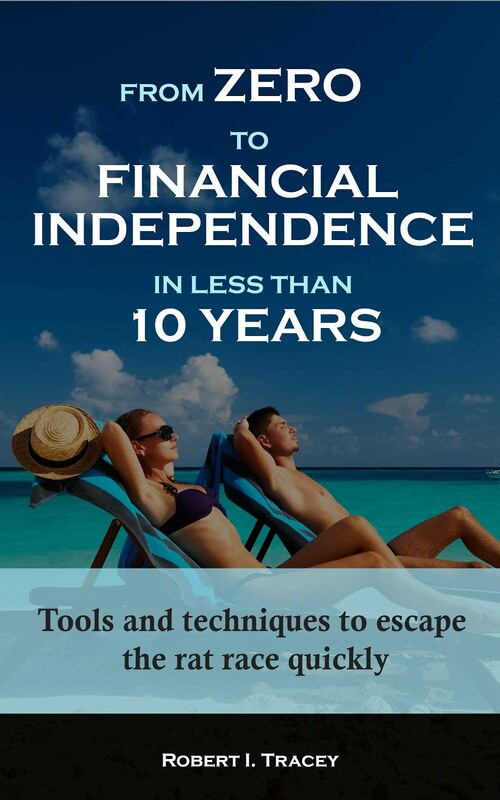 My Annual Investments were based on me investing around 60% of my gross annual earnings and I entered my time to retirement (Years) as 7 years. Asset Mix was entered as my Desired Low Charge Portfolio as I describe regularly on the site including here. The Expected Return was provided as 8.99% with a 3 year standard deviation of 13.18. An Expected Return of 8.99% seems a little bullish for my tastes. Using my models I have a current expected annual return after inflation of 4.2%. The UK arithmetic mean of the retail prices index (RPI) since 1987 is 3.5%. Totally these would give an expected return of around 7.7% before inflation which is a variation of 1.29%.